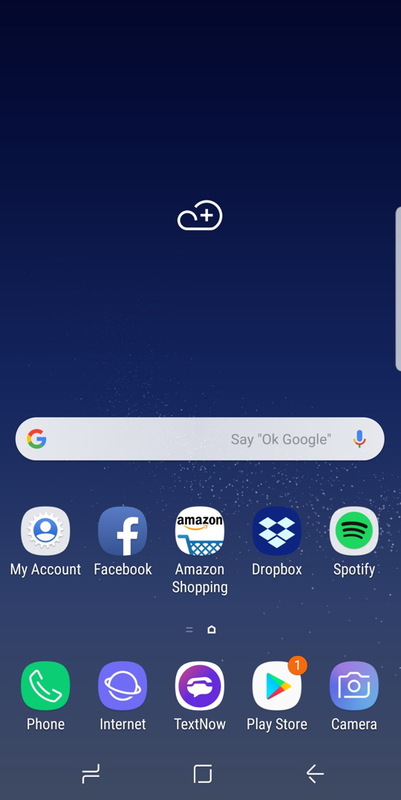 How to Setup Android Weather Widget on Samsung Phone? My son gave me a brand new Samsung phone, which is great. But there’s a little cloud in the middle of the home screen. Is that how I get to weather? How can I just have the weather on my home screen? 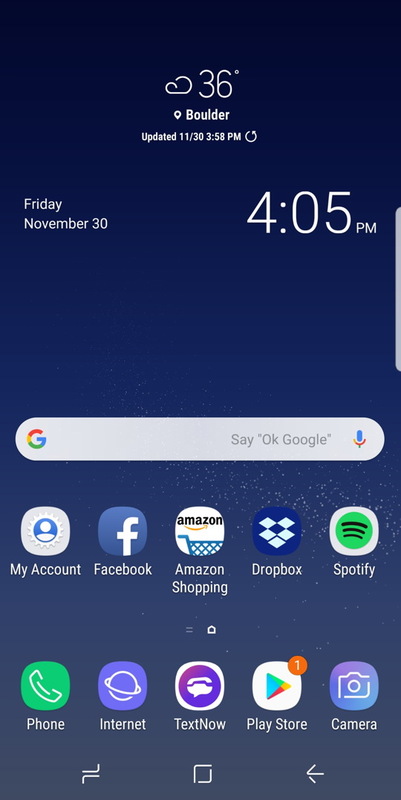 By default different Android phones have different home screens because big companies like Samsung add their own user interface (UI) layer to stock Android. Samsung calls it the “Samsung Experience” and while it adds a lot to your daily interaction, it also has the unfortunate side effect of meaning that someone with a different kind of Android phone probably can’t help you figure out the nuances of configuring everything and getting it all set up properly. Life in Android land. Fortunately new smartphones constantly arrive at our offices so there’s always some sort of device lying around, ready for tests and experimentation. This time I’ll be using a Samsung Galaxy S8 running, you guessed it, Samsung Experience 9.0 atop Android 8.0. You can check too, just go into Settings > About phone > Software information. With some effort, you can probably disable or remove Samsung Experience, but… why? I’d suggest you stick with it. As you can see, it’s been a pretty dreary and cold day here in Boulder, Colorado! That’s okay, we’re used to it here. SUCH an improvement. But let’s not stop there. 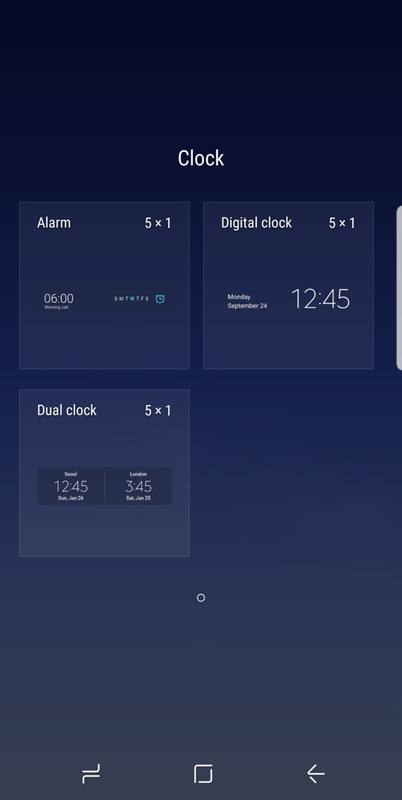 Let’s add a nice, big clock that shows us the current time too. Eventually, we can resize things and reorganize them to get exactly the layout you prefer, but for now, let’s just go full metal widget! 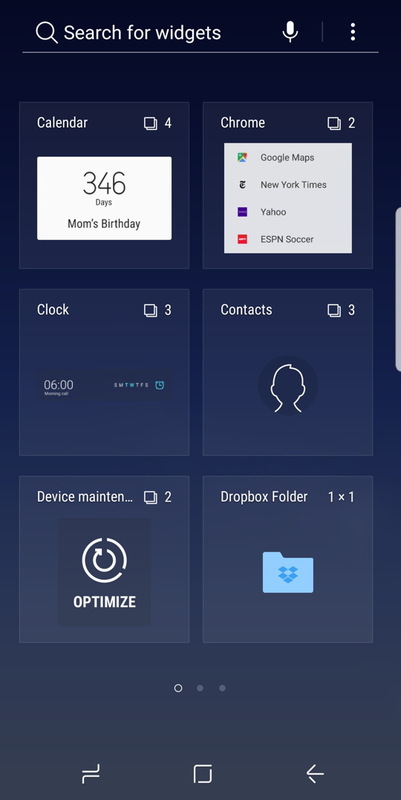 To get to the widget configuration area, tap and hold on the home screen. I usually do so on a blank area, but it doesn’t really matter. In this view you can tap and drag icons around, move icons from screen to screen, even get rid of ’em. But more importantly, you can change Wallpaper, Theme, add Widgets or tweak the home screen settings. Handy! Notice the tiny “+” symbols and the big cyan border around the clock widget. Since you’re still in settings mode, you can make the widget bigger by taping and dragging one of the cyan dots, or move the widget elsewhere on the screen by tapping in the center and dragging it where you want. I like it. And now you know how to duplicate it on your Android phone if you so desire, or tweak it to match your own preferences. Don’t forget to go back and change your theme and/or wallpaper to really customize your look. It’s worth the effort! Pro Tip: Turns out we have lots of Android help on the site. Please take a few minutes and check it out while you’re here! Never miss a single article, review or tutorial here on AskDaveTaylor, sign up for my fun weekly newsletter! I do have a lot to say, and questions of my own for that matter, but first I'd like to say thank you, Dave, for all your helpful information by buying you a cup of coffee!